There's a lot more to us than flags! It’s going to be a HUGE celebration for the LGBTQ2+ community in Vancouver and we’re thrilled to be part of the festivities. Who needs a social planner when you’ve got The Flag Shop weekly blog? There are so many events happening in Vancouver, we couldn’t possibly name them all! Wednesday, July 26, 3 p.m. – 10 p.m.
Take in the live music, roving performers and interactive art. While you’re there, visit the community village for games and resources. Wednesday, August 2, 5 p.m. – 10 p.m. Check out the 1st Prance on the Pier, a free, all-ages dance with music, food, drag performances and games. 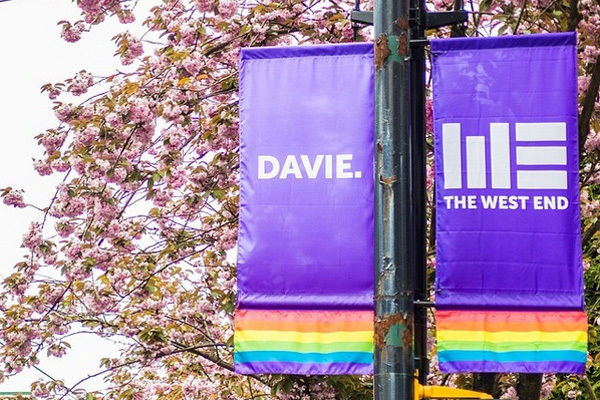 Enjoy the beer garden with the party spilling out from the Community Stage at Davie Street’s historic Rainbow Crosswalk on Bute Street. Friday, August 4, 9 p.m. – 2 a.m. If you’ve never experienced a Pride Man Up – Get! In! To! The! Groove! Don’t miss performances by Vixen Von Flex, Owen + Papi J, Jem + Ponyboy and more. 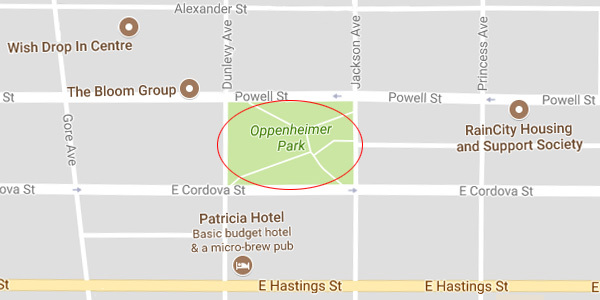 Friday, August 4, 5:30 p.m. – 8:30 p.m.
Meet up at Clark Park at 5:30. Remember your signs or make them with supplies we provide! Be free and fab and wear what you like! Saturday August 5, 8:30 a.m. 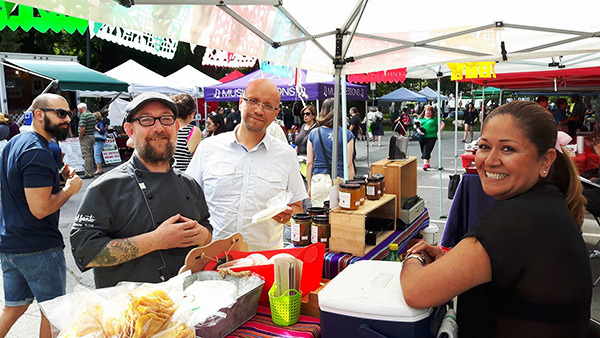 The Vancouver Pride Society is hosting a by-donation community breakfast honouring the memory of Terry Wallace, one of the founders of Pride in Vancouver. Saturday August 5, 11 a.m. – 5 p.m. The march will leave McSpadden Park at noon, moving down Commercial Drive and ending at Grandview Park for the festival. Featuring queer-friendly displays and performing artists, come out and join the fun with the community, friends and family. Sunday, August 6 is the BIG Day! Pride Fest is happening at Sunset Beach from 11 a.m. – 6 p.m., and YES – we will be there! We love this festival because it is a safe and super fun environment for self-expression and a collective, public declaration of anti-bullying. Stop by our booth and we’ll set you up to express your pride! 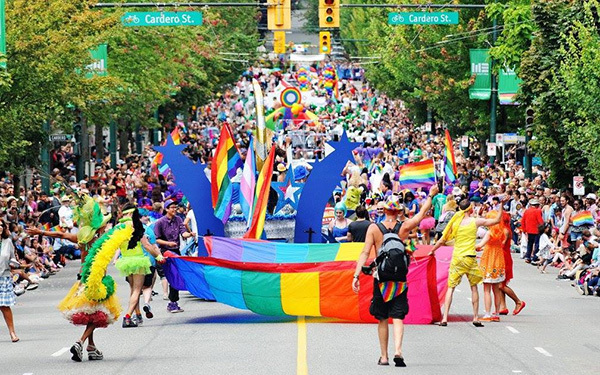 The 39th Annual Pride Parade, a major highlight, runs from noon – 3 p.m., starting on Robson, turning down Denman, and then onto Beach Ave. It ends at Beach Ave and Pacific. Our Pride and Anti-Bullying websites honour the truth that we are all equally deserving of the basic rights of freedom of expression and freedom from oppression. We are thrilled to work with Canada’s LGBTQ2+ communities in support of efforts to end discrimination and violence, while promoting self-affirmation, dignity and equality rights. 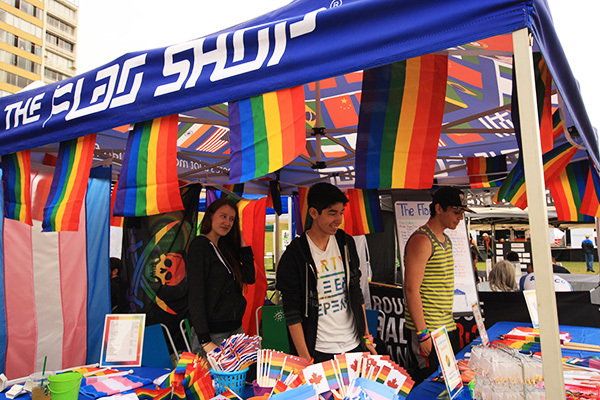 The Flag Shop booth at the Vancouver Pride Festival in 2016. For more information about Pride Fest, please visit the Vancouver Pride Society’s official website. See you at Pride Fest! It’s time to get ready for the Powell Street Festival, whether you’re interested in film, martial arts, live music, Ikebana demos (flower arranging), sumo wrestling, dance, crafts, Taiko, theatre, Anime, childrens’ activities or Japanese food – there’s something for everyone. 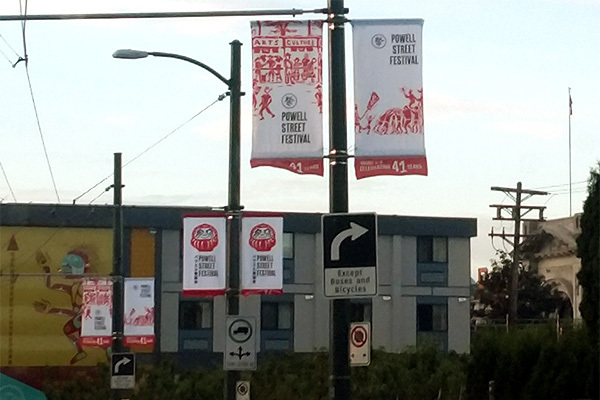 The Powell Street Festival is rich in arts and culture and has been around for over 40 years. Featuring more than 20 food vendors, delicious Japanese fare will be available through stalls lining Dunlevy and Jackson. Be sure to visit Macro-Maki to dress up in pillow-sized sushi costumes and take selfies on a massive sushi tray. The craft market will offer original, one-of-a-kind, hand-made goods. This year’s program includes a captivating mix of regional and international talent. Japanese blues, anyone? George & Noriko are a dynamic duo of a Japanese blues cowboy and a Tsugaru shamisen player, from Melbourne, Australia. Ensemble Liberta will play their classical Japanese instruments, and Kisyuu will do live calligraphy demos. If you like Taiko (Japanese drumming and percussion), JODAIKO from California will be there, too! If you like film, screenings co-presented with the Hapa-palooza Festival will include award-winning short film Born with It, as well as episodes from Almost Asian, starring Katie Malia, who will also attend. Our client, The Powell Street Festival Society, which organizes and produces this event, is guided by a vision of a society which is enriched and interconnected through Japanese Canadian arts and culture. The society encourages the recognition of Japanese Canadians as a creative force within our community. Mark your calendars for Saturday, August 5 and Sunday, August 6 to be a part of the largest Japanese Canadian festival in Canada. 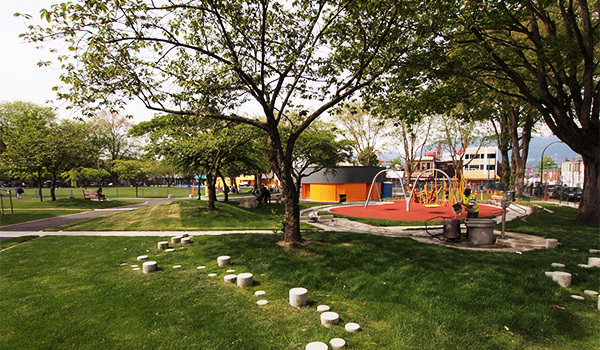 The main location is Oppenheimer Park in the 400 block of Powell Street, with festival activities spilling over to surrounding areas of the Firehall Arts Centre on Cordova Street, the Vancouver Japanese Language School and Japanese Hall on Alexander Street and the Vancouver Buddhist Temple on Jackson Avenue. When you’re in the area, check out the street banners up at Victory Square and on Main Street between National and Southern. 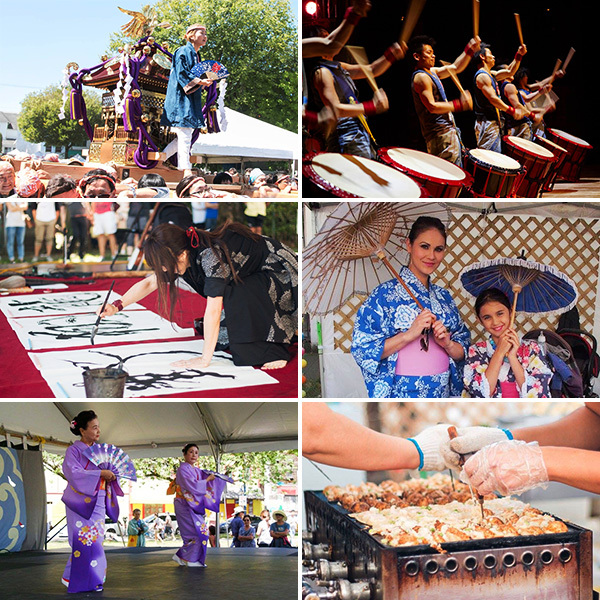 The festival showcases Japanese talent and culture, and it’s also a community building opportunity. The event helps to build a community bridge so the people of the community can experience the beauty and diversity of Japanese Canadian arts and culture. We’re so excited because this festival is happening right down the street from us, in our own neighbourhood! Don’t forget your Japanese flag and your Canada/Japan Friendship Pins. 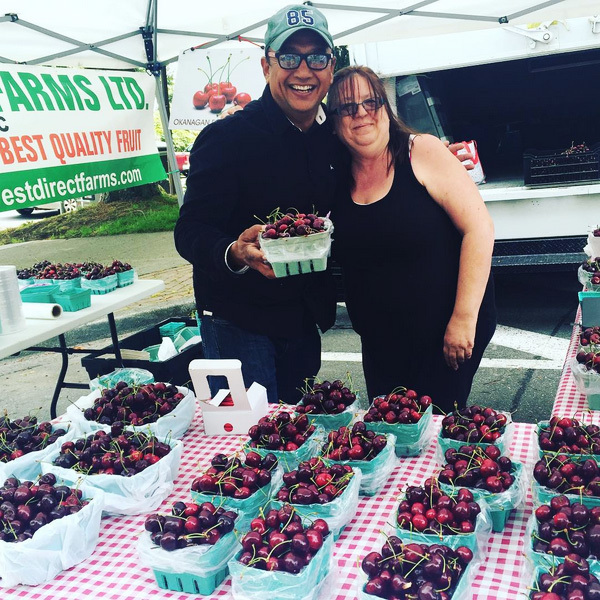 Farmer’s market season is here in BC and we love that we have so many amazing markets to choose from! 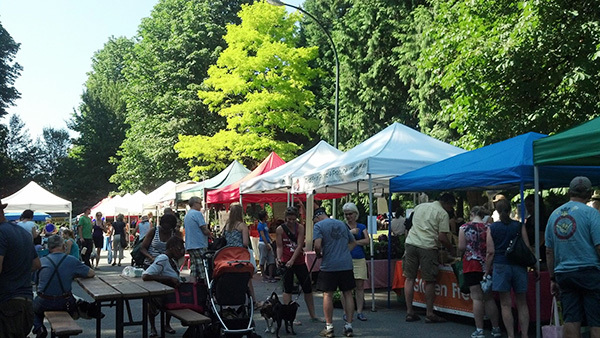 Whether it’s the Mount Pleasant, the Hastings Park, or the Kitsilano Farmers Market, don’t miss your chance to experience the fun of shopping at the markets in your neighbourhood. Aside from the fun of it all, there are many other awesome benefits to think about. Super fresh fruits and vegetables bursting with flavour and goodness remind us all what fruits and vegetables are meant to taste like. This week we’re focusing on one of our clients, the New West Farmers Market, located at Tipperary Park in New Westminster, which is open for business until October, on Thursdays from 3:00 – 7:00 p.m. Be sure to get there early to experience the best of the market, including farm-fresh produce, local crafts, prepared gourmet foods, and live entertainment. And while you’re there, check out the street banners displayed against the bright blue sky! 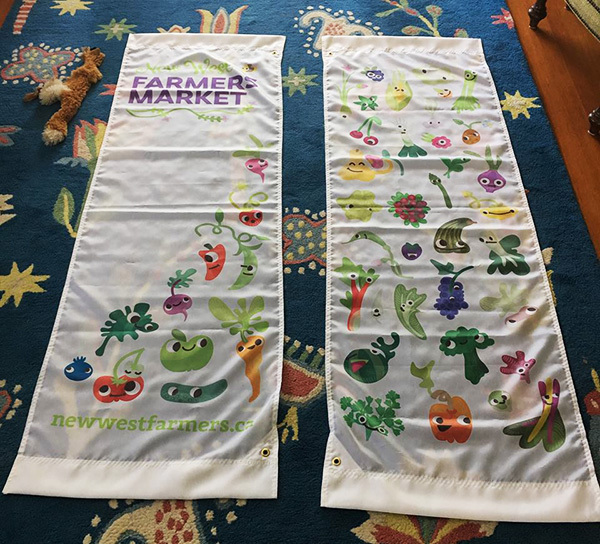 The mission of the New West Farmers Market Association is to focus on environmentally sustainable food production by bringing locally grown and produced foods to the community, thereby contributing to local economic development, healthy eating, and food security while connecting with our heritage of having a vibrant city market. This is the beauty of the farmers market: the fruits and vegetables ripen in the field and are brought directly to the market. They have not been shipped long distances, have not been gassed to force ripening, and they have not been sitting in storage for weeks before reaching your table. It’s the best available produce because it’s been grown and harvested in your own community. Knowing what’s in season is easy at the farmer’s market because whatever is growing is what they are selling. Favorites include berries and corn on the cob in summer, and pumpkins and apples in the fall. If you enjoy connecting with your community and knowing exactly where your food comes from, just head out to your local farmers market! Farming reminds us all of simpler times when we knew where our food came from and we knew the people who grew it. And, even though the world has changed dramatically, we all share a basic understanding of what it means to live off the land. Farming is an important part of our collective heritage, and contributes to the local economy. Buying locally-grown produce means supporting farming families, while they feed ours. People are opting for fresh fruits and vegetables, artisan foods such as local cheeses, as well as proteins, home-style baked goods and even locally-grown flowers. If you plan on doing the circuit, or for more information about farmers markets, please visit eatlocal.org for BC, or traveltowellness.com for options across Canada. 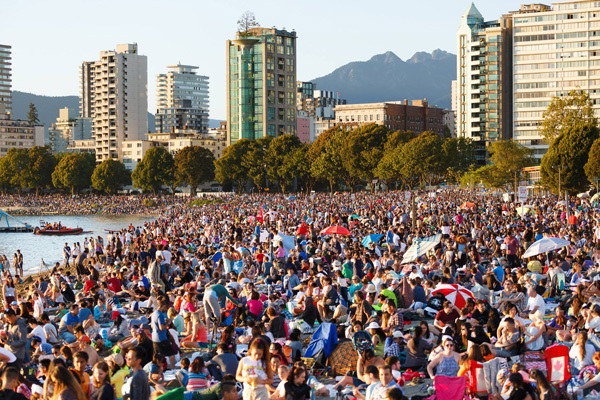 For nearly 30 years, Vancouverites have experienced the beauty and majesty of the Honda Celebration of Light, a world-class fireworks display and competition which attracts 1.4 million local, regional and international visitors each year. Word is, until you’ve seen Vancouver’s Celebration of Light, you’ve never really seen fireworks the way they’re meant to be seen. 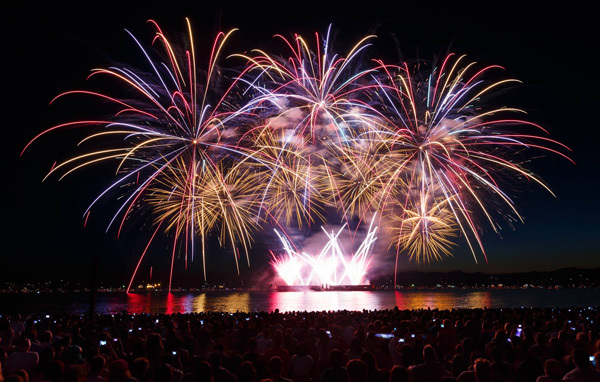 Known as one of the major events in the city, its fireworks illuminate the sky over English Bay for three nights, ending on the Saturday of the August long weekend. We have been supporting this event for many years, supplying flags to the throngs of people making their way to the celebration. Since 2013, we have been working with the event organizer and producers, supplying the street banners that create anticipation in the community and make our streets look even more beautiful. 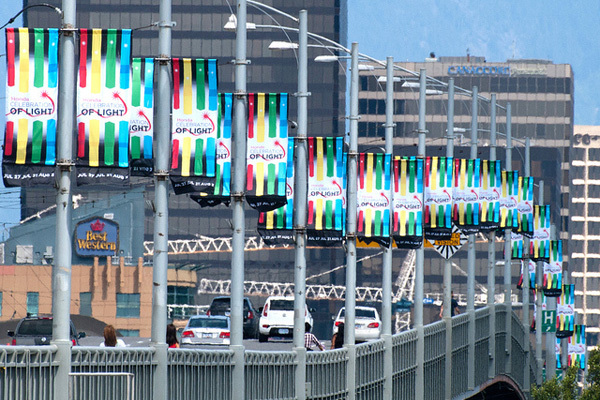 You can see them for yourself on the Granville Street Bridge. The festival’s core purpose is to “spark togetherness.” So, is it really any wonder we’re thrilled to be a part of it all? Our friends at the West End BIA feel the same as we do! Keep your eyes to the sky to see more street banners coming soon to the West End, right where the celebration will be happening. The Honda Celebration of Light (originally known as Benson & Hedges Symphony of Fire and then the HSBC Symphony of Fire) is an annual musical fireworks competition. The first Symphony of Fire was held in 1990. Today, this event is known as one of Vancouver’s largest festivals. It is recognized as the longest running off-shore fireworks competition in the world. This year, the competition will feature companies from Japan (Akariya Fireworks), the United Kingdom (Jubilee Fireworks) and Canada (Royal Pyrotechnie). To celebrate Canada’s 150th anniversary, each of the competitors will be required to include one iconic Canadian song in their display. As if the fireworks were not enough to draw the crowds, the Celebration of Light kicks off each afternoon with live music at Sunset Beach. 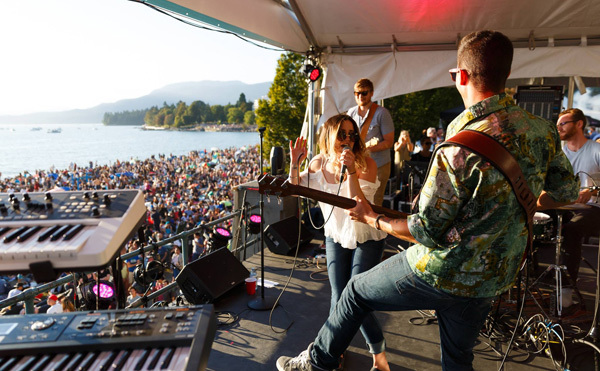 Known as ShoreFest, it is Vancouver’s largest community concert, and is free of charge. Musicians begin performing in the early afternoon and leading up to fireworks in the evening. For more information about this year’s event, please visit their official website. You are currently browsing the The Flag Shop Blog blog archives for July, 2017. No Matter How You Like to Celebrate, Easter Weekend is Almost Here! © 2019 The Flag Shop. All rights reserved.